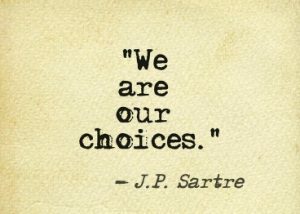 Wemake choices every day of our lives. Some choices are positive, and some not so much. Sometimes we are faced with making the choices that may or may not be revocable. Which could mean: we are faced with hard choices. Sometimes we don’t want to face these hard choices because of the impact that it may have on our lives. Have you been faced with a hard choice? How did you come to your decision? Was it just logic? Was it based on emotion? Did you not want to face it right away? As humans, we cope in different ways especially when we make hard choices. And as humans, each person faces hard choices in different ways. When I wrote this story, I used my own personal experience. Two years ago, my family was faced with a hard decision. The decisions that I had to make everyday made me realize that I had to push myself for my family. But, as I made some of the decisions, I just went through the motions. After I made that decision, I was emotional afterwards not knowing the outcome of the hard choice that I had to make. I just knew that I had to make decisions very fast. That was why I wrote, Public Affairs, the way I did. I wanted to show to my readers that hard choices can be dealt in many ways. Two of the main characters, Ella and Minnie, are both faced with hard decisions. Although their stories are told in different time periods, they each must face something. As the reader, you are taken on a journey to see how they reach their decision. As I wrote the book, I wanted to make sure that the reader understood the whole story by taking them on a voyage of showing how Minnie and Ella are before, during and after their hard decisions. I poured how I was feeling and what I was going through during this hard decision. Check out Public Affairs, coming September 2018!